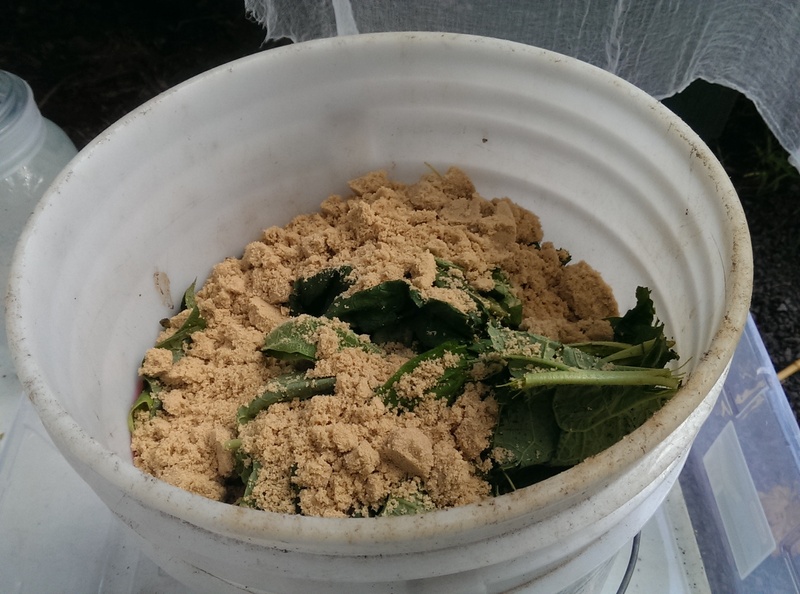 Fermented Plant Juice is a fermentation process in which harvested fast growing plants are mixed with brown sugar to extract the plant materials. This creates an “input” that will be used on plants as a foliar spray that can be sprayed onto garden beds for plant and soil health. Plants selected for the FPJ should be rapid, hardy growers. Best to avoid woody plants as they do not contain the nutrients to extract. Think leafy green. Before sunrise the plant is in respiration mode. After sunrise it is in photosynthetic mode therefor it is required that the harvesting of your plant should be done before sunrise to capture the desired nutrients. Also do not rinse the plants once collected. 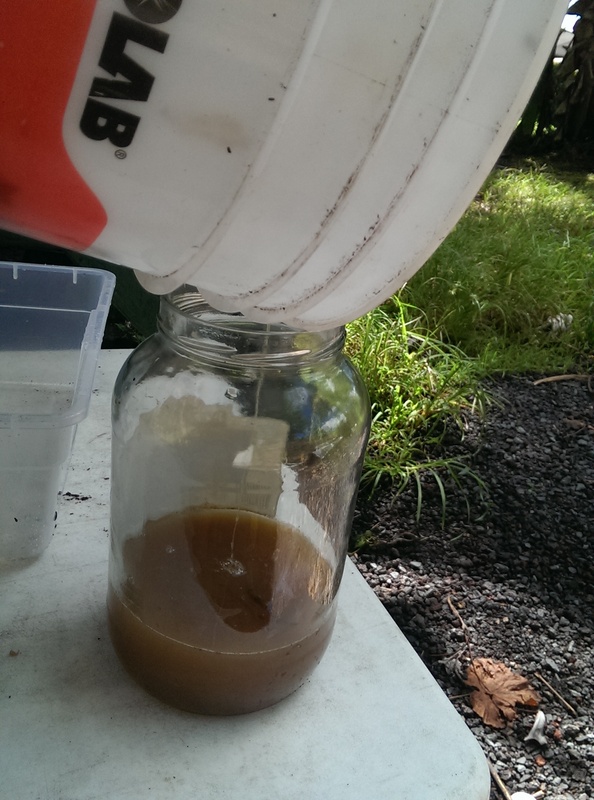 This will keep all healthy microbe activity to pass on to your fermentation process and increase the FPJ’s value. Select vibrant, healthy plants when harvesting. The plant we are using for FPJ is Comfrey. Comfrey is a fast growing plant producing huge amounts of leaves. -Harvest Comfrey leaves before sunrise, preferably in the dark. Cut off the tops of the plant leaving about 2 inches left above the soil. Select only healthy, vibrant leaves. Compost any leaves that you do not select. – Mix brown sugar into comfrey leaves with hands (gloves). Massage the brown sugar into the comfrey until all the leaves are well saturated. Comfrey leaves will shrink down to a fraction of it’s original size. -Place second bucket on top of comfrey and place brick or large stone inside bucket to serve as a weight for 24 hours. 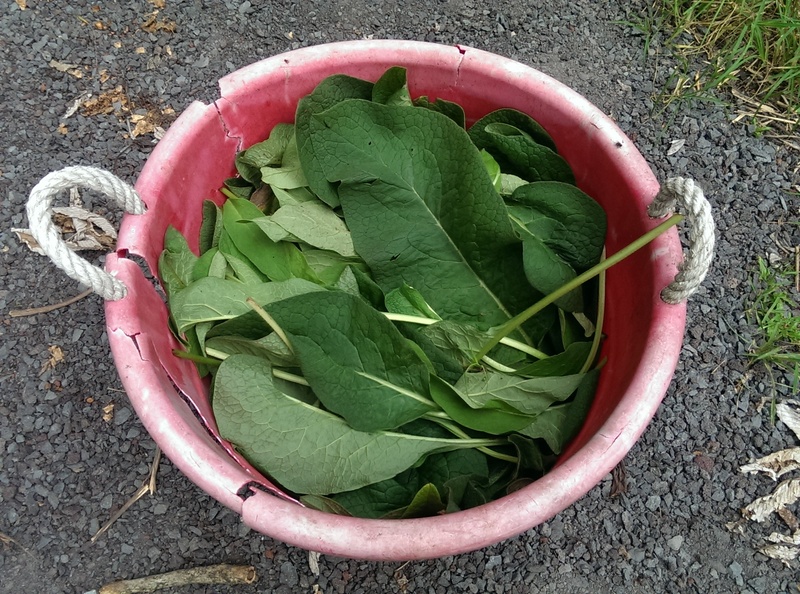 Second bucket compresses the comfrey down to create a compact environment for the brown sugar to extract the moisture from the comfrey leaves. 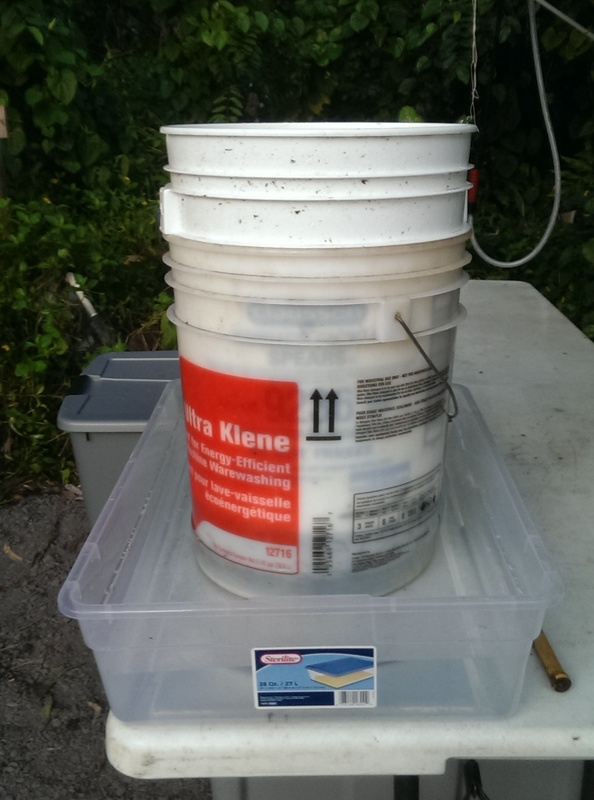 In addition the buckets should be placed in the middle of a shallow container of water to keep fire ants (if you live in the jungle) from infesting the brown sugar mixture. 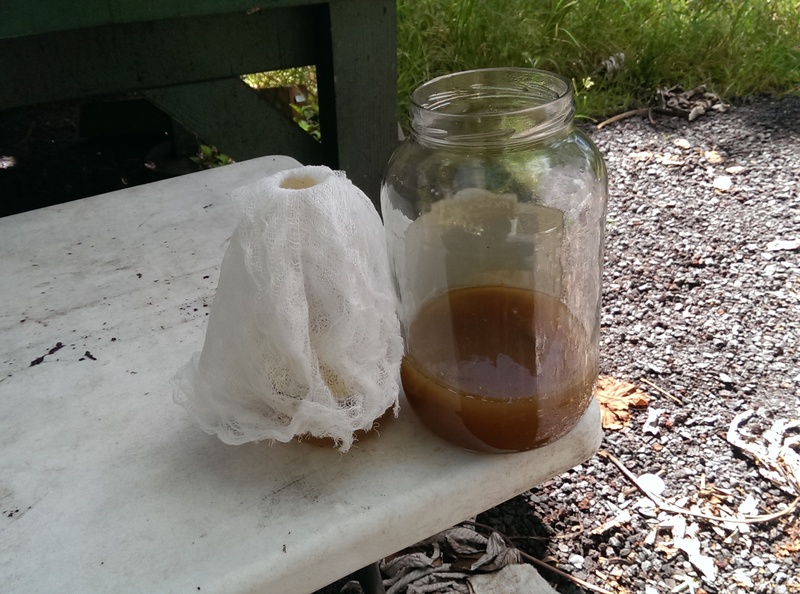 -After 24 hours of the compression, removed weighted bucket and put cheese cloth with string over fermenting comfrey. 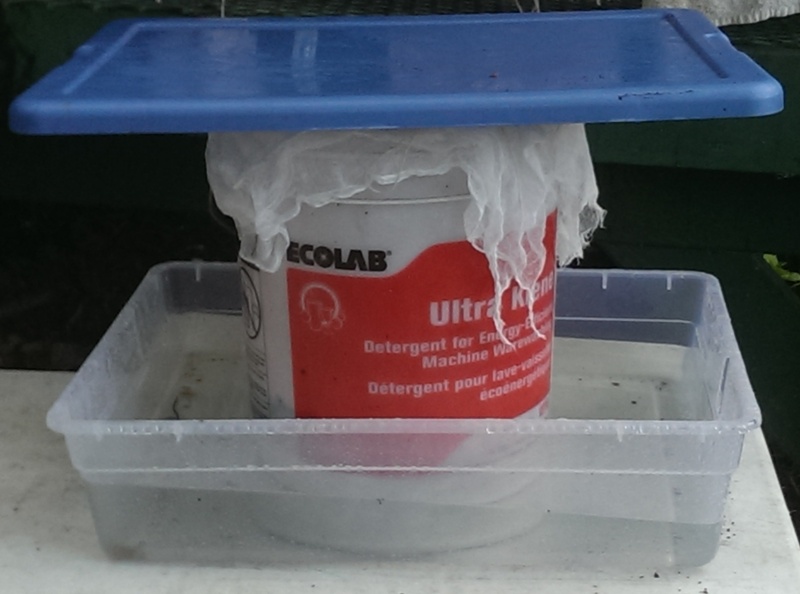 Placed a container lid lightly on top to keep rain out or keep in a very dry, shaded area. 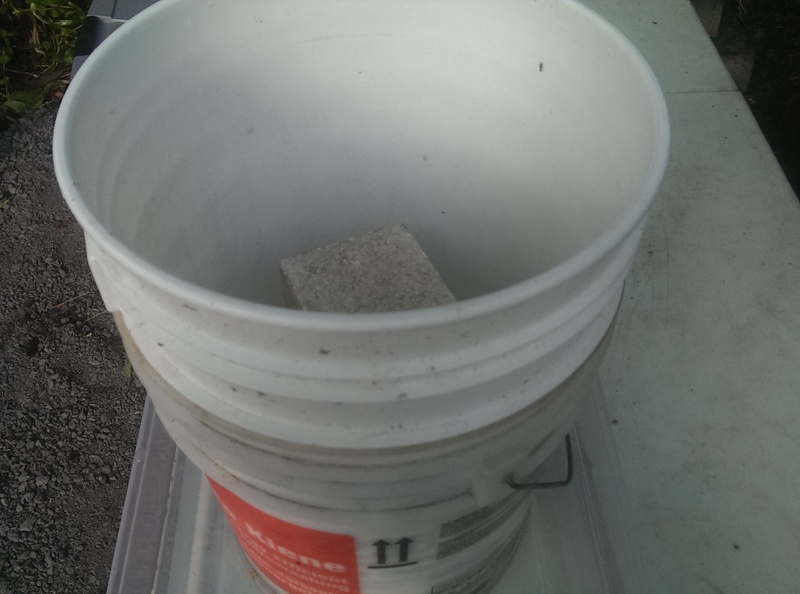 Also keep fermenting bucket in shallow container of water to keep the fire ants out. -It is also beneficial to rotate and swish the bucket regularly (without taking the cheese cloth off) to mix and move the contents inside. This helps assist keeping undesired mold from forming on top of the comfrey. -Let the contents ferment for a few weeks. I am desiring most of the brown sugar to be fermented off so that the final liquid is not too sweet containing too much sugar. If there is a lot of sugar remaining from the fermentation process, the fire ants will swarm the plants immediately after spraying the “input” onto the leaves (welcome to the jungle!). 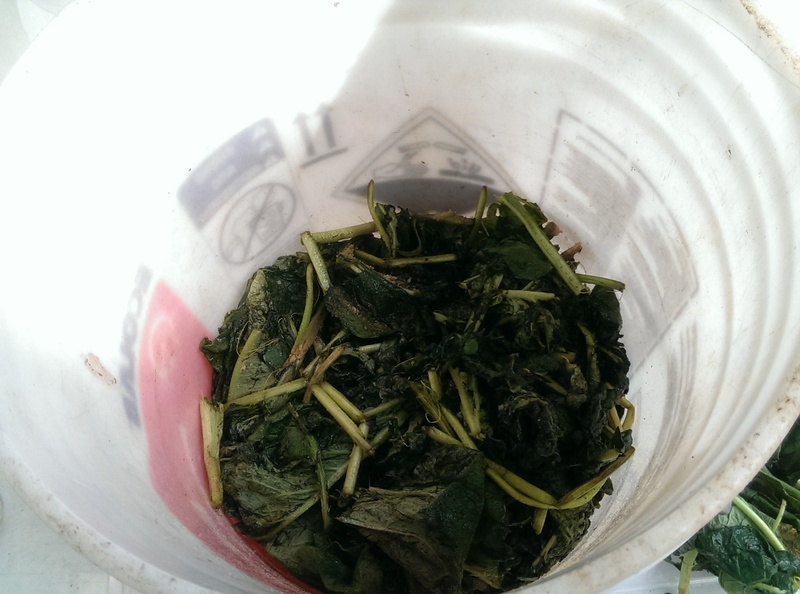 *NOTE: There most likely will be mold on top of comfrey plants that are not submerged in the fermented liquid. This is normal and no need to worry. Everything is correct. Just hold back the comfrey leaves and mold that are found on top while slowly pouring out (into a new container) the liquid that has been fermented (“FPJ”) from the bottom. -This would be the same for any typical fermenting process of any matter: when the matter is not protected in the juices (an anaerobic environment), the top matter that is exposed to the air (aerobic environment) will form this type of harmless mold. The matter below in the fermented juices and the juices at the bottom are alive and healthy, full of all the micro-organisms and probiotics ready to go to work. -Strain FPJ into new container with cheese cloth to remove any remaining particles. -For long term storage you can mix the FPJ 1:1 ratio with brown sugar or molasses. The FPJ should now be stored in a plastic food grade container with lid and air lock. 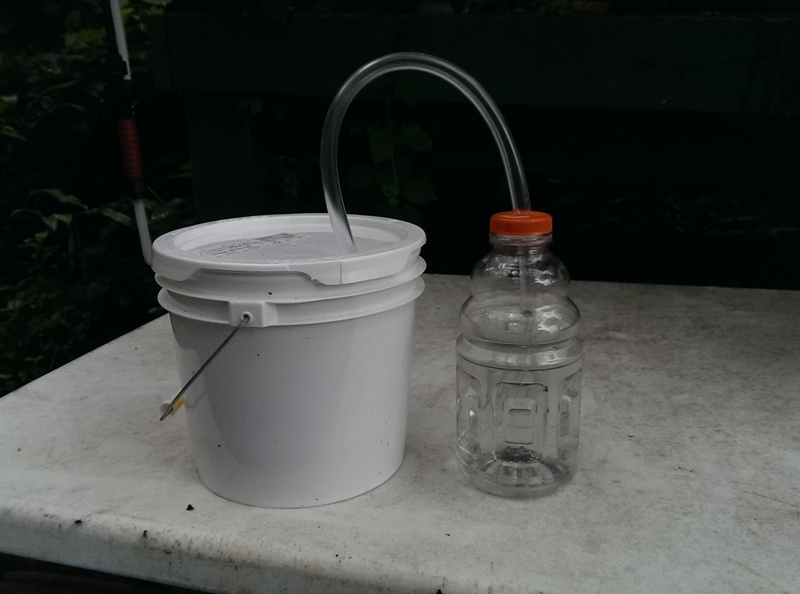 The contents produces gas so without an airlock the container will expand/explode. FPJ is diluted with non-chlorinated water in a 1:500 to 1:1000 (FPJ:Water) ratio. This input is used as a foliar spray and on garden beds. Spraying should be done before sunrise. FPJ can be mixed with other inputs at the time of spraying however needs to be stored separately.